Have you ever wondered how the alloys you use in highly corrosive applications are melted? Corrosion Materials Metallurgist, Jacob Rodriguez, will explain the various melt processes for wrought Nickel Alloys. Nonmetallic impurities include: S (Sulfur) and P (Phosphorus). Residual gases include: H2 (Hydrogen), N (Nitrogen), and O (Oxygen). There must be tight control over chemical composition to ensure the melt consistently is within specification requirements. Ni (Nickel), Cr (Chromium) and Mo (Molybdenum) are expensive and for any amount to be lost to oxidation during melt is undesirable. No contamination from container or atmosphere. It is impossible to achieve the final product in a one-step melting process. Therefore, there is a need for two or more steps to complete melting process. “Making” the alloy from the charge (pure metal, scrap, master alloy etc.). Melting processes that fall into this category include the following. Decarburization which is the process of reducing of carbon content. Supplemental processes that fall into this category include the following. The primary focus is on solidification control to produce an ingot that has high structural integrity for subsequent thermomechanical processing (rolling, forging or drawing). Removal of inclusions through remelting and controlling the environment the molten metal is exposed to as it solidifies. Below is an overview of how each process is handled. The AOD process takes advantage of the chemical reactions that happen to Cr (chromium) and O (oxygen) and the resulting reaction with C (carbon). It turns the C into a gas which can be “blown” out of the melt. Additional processes like reduction and desulfurization can also be performed during the AOD process by the introduction of additives, such as lime to control the slag and reduce sulfur and oxygen levels. The Vacuum Oxygen Decarburization is a process similar to AOD and is used when very low levels of hydrogen or carbon + nitrogen are required. The vessel is enclosed and a vacuum is pulled. • Allows impure or high carbon material to be melted, since material will be burned off and refined through decarburization step. • Low impurity material is produced: S (Sulfur), N (Nitrogen), H2 (Hydrogen) and O(Oxygen). • Near full recovery of Cr (Chromium) and other elements susceptible to oxidation from the slag. The Induction Melting process requires no combustion or electric arc to be used, it can be enclosed or open air. The metal is placed in a refractory vessel that is surrounded by a water cooled copper induction coil. A high AC (alternating current) is passed through the coil and a current creates alternating magnetic fields that induce intense heat into the metal and melts it without any contact being made. The Vacuum Induction Melting technique uses “pre-refined” ingots, virgin alloys or vacuum revert as a charge. Completely enclosed and uses a pump to evacuate the chamber of air. The metal only gets as hot as required to melt the metal allowing for precise temperature control. There is also low dust output and close composition tolerances. The most effective types of secondary melting process or “remelt” processes use a consumable electrode. The goal is to further refine the molten metal from gases, metallic and nonmetallic impurities and inclusions. Also, to produce larger ingots with uniform composition along with a dense, homogeneous microstructure that is free of defects. There are several steps to the remelt process which include melting of the electrode, then to transfer of metal to molten pool through vacuum, atmosphere and/or slag layer. The solid metal transforms and stays liquid in a variable shape and depth. Lastly, the solidification and buildup of the ingot in a progressive controlled manner. The Vacuum Arc Remelt is when heat is generated by application of low voltage high current arc between the surface of the electrode and molten pool. Metal droplets form on the tip of the electrode and drop into the molten pool, eventually melting the electrode in the vacuum. Solidification takes place inside the water cooled copper mold. This solidification eliminates the macro segregation and reduces micro segregation. Segregation of the elements can lead to poor mechanical properties. This process reduces inclusions in the material and removes gases and volatile elements from the melt. The reactions that take place in a VAR melt, will dissociate unwanted unstable oxides and tramp elements, melt carbides, deoxidize and degasify the material. It can be performed over and over. Titanium mills sometimes have a triple VAR melt. The Electroslag Remelt technique is more widely used on nickel alloys. The starting stock is usually a VIM or EAF ingot where solidification is controlled and metal segregation is limited. This is typically used where the end use requires a high microstructural cleanliness. 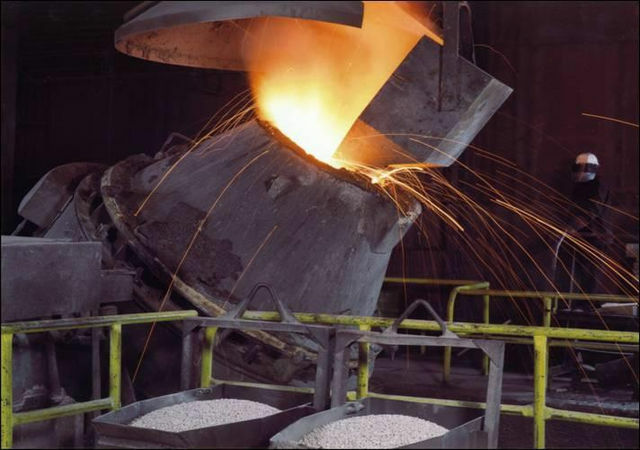 A refractory slag refers to the heat resistant material used in almost all processes involving elevated temperatures and/or corrosive environment and is used and elevated to a point where it remains molten. This molten slag then is what “filters” the melting electrode into the refined solidifying ingot beneath the slag. The slag shields the melt from harmful oxides and ensures that no harmful cavities will be in the final ingot. Water cooled mold like a VAR, extracts the heat created during melting and maintains a shallow molten pool that causes quick solidification, yielding better homogeneity and improves inclusion distribution. Th EB uses a hearth melting of material via electron beams, while solidification is controlled in the mold by another electron beam. This is performed under a vacuum. The consumable can be an electrode, powder, scrap, or pellet that is introduced by hoppers into the path of the beam. The advantage of using this method is Improved purity and cleanliness over VAR and ESR processes. There is more heating flexibility in melting or refining and lower nitrogen and oxygen contents with high production rates. In addition to our extensive inventory of corrosion resistant alloys, we provide technical expertise and solutions for our customers with many other services. Our on-staff metallurgist, Jacob Rodriguez, provides support to our sales staff as well as our customers. He can answer technical questions regarding our alloys and help customers make an informed decision to suit their material needs.